The Eastern Maine Agility Club is hosting a three-day dog agility event at the Skowhegan State Fair Grounds, starting today and running through Sunday. 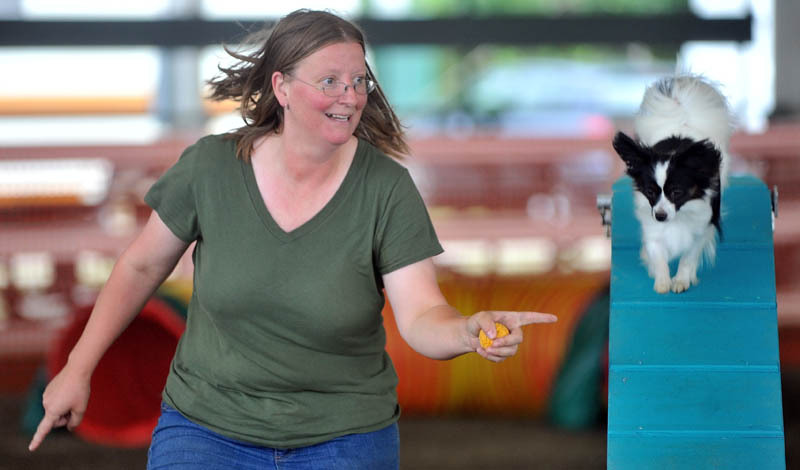 Rebecca Henderson, of Holden, makes a practice run with her 1-year-old papillon, Keeper, through the agility obstacle course, hosted by the Eastern Maine Agility Club and sanctioned by Canine Performance Events, at the Skowhegan State Fair Grounds on Thursday. The event begins today and runs through Sunday. It features more than 175 dogs and 100 handlers for three days of dog agility events and contests.